Sharon Shorty is a Yukon First Nation storyteller, writer and comedian of Tlingit, Northern Tutchone and Norwegian ancestry. Sharon Shorty is from the Tlingit, Northern Tutchone and Norwegian People. Sharon is from the Raven Clan and was raised with the storytelling tradition of her southern Yukon community. Her grandmothers taught her storytelling using traditional mentorship/apprentice techniques. As a result, she lkes nothing more than to share stories in various genres. Her popular character “Grandma Susie” tells the old stories as well as her adventures with Colonel Sanders and trips to New York City. As a playwright, her stories reflect her people. In Trickster Visits the Old Folks Home, an elder is moved to a nursing home, against her will. She has appeared on APTN, CBC, and CTV. In 2012, on Canada Day,she received the Queen Elizabeth II Diamond Jubilee Medal for significant public service to the Yukon and Canada alike. 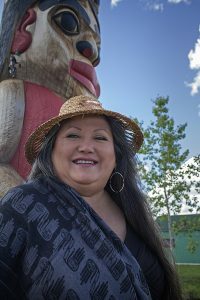 Sharon is also an award winning actor and Storyteller And more importantly, Sharon is an award-winning Bannock-Maker! Gramma Susie’s character as represented by her avatar can now be seen at the Canadian Museum of Civilization. Sharon worked as Regina’s first Aboriginal Storyteller-in-Residence and was at Vancouver Public Library as the Aboriginal Storyteller in Residence in 2015. Sharon is the Speaker of Teslin Tlingit Council. She also tells traditional stories and teaches about her culture. Sharon now lives in her home territory with her family.